Today I received an e-mail from the American Freedom Campaign (AFC), an organization founded by several prominent liberals, including Naomi Wolf, author of The End of America. Among the list of official supporters of the AFC are Amnesty International and the Center for Constitutional Rights. The AFC e-mail I received alerted me to an unprecentented order by George W. Bush that for the first time in history has assigned an army combat brigade to deal with emergencies and insurrections on U.S. soil. …this new mission marks the first time an active unit has been given a dedicated assignment to NorthCom, a joint command established in 2002 to provide command and control for federal homeland defense efforts and coordinate defense support of civil authorities. Still Think I Should Quit, Do Ya? Well, wasn’t that a lot more interesting than the Presidential debate? 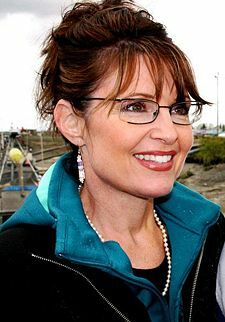 Sarah Palin dispelled the ridiculous caricatures that the media has been busily shoving down our throats. No, the woman is not a bimbo. No, she is not an ignorant redneck. And she is not crazy or extreme. She is the girl next door – the smart, driven and attractive one, of course. But more importantly, she is a standard-issue Reagan Republican, which is not a compliment from me, since I hate Reagan with a white-hot passion. However, it is more than thrilling for her base, which has been looking for a new Reagan ever since the man left office in 1988, eight years too late for women, minorities and the middle and poorer classes in America. And her strength, energy, passion, and command of the facts should reassure those on the conservative side that were, either sincerely or insincerely, agitating for her replacement. They will no doubt be over the moon today. Both Sarah and Joe made the points they wanted to make. Unfortunately for Joe, his points were not particularly convincing. As I’ve said time and again, Barack Obama’s main problem is that he has ceded far too many points to the Republicans. Thus, Biden was stuck defending Obama’s stupid non-positions, like “The surge worked, but I wouldn’t have voted for it anyway.” On gay rights, Biden made it sound as if the Democratic platform is the same as the Republican platform, when in fact, the O’Biden ticket believes in granting civil unions the same rights as marriage. On offshore drilling, Biden also agreed with Palin, practically chanting “Drill, baby, drill” right along with her. Joe Biden was also determined to follow the Obama line of attack – that McPalin is Bush. Unfortunately, that attack has not been effective – otherwise, Obama would be 25 points ahead, since Republicans, Democrats, Independents and Rosicrucians all agree that Bush is a horrible President. But Americans don’t like Congresscritters either, and Biden is one, as are McCain and Obama. This strategy of blaming Bush for everything worked in 2006, but now the Democrats share the blame for not impeaching him and ending the war, as they promised to do. They said they would drain the swamp, but they left the biggest messes untouched. I guess it’s no surprise by now that we are totally in love with Sarah. No, she is no Hillary Clinton. They really aren’t in the same league. Hillary is ready to be president. But in this vice presidential debate, she was more than able to stand up to Joe Biden. It was a big mistake to underestimate her. She may not have the foreign policy experience yet but it isn’t hard to see how she got to be governor of Alaska and have an 81% approval rating. She comes across as smart, enthusuastic and tenacious. I would love to see Sarah debate Brack Obama. Something tells me she’d wipe the floor with him. Her crisp concise delivery would be in sharp contrast to his rambling and frequently incoherent one. As a matter of fact, Obama doesn’t stand up in contrast to anyone very well. He also needs a lot of assistance from his party. Everyone is pulling together to help Barack. Pelosi, Reid and Howard Dean finagled the delegate count and got him nominated. The whole DNC apparatus has been moved to Chicago to be at his disposal and the money is flowing to his campaign at the expense of others. Bill Clinton is out stumping for him and is under constant criticism for not doing enough. Hillary is pulling out all of the stops as well. The only thing they haven’t demanded of her is that she do Obama’s debates for him. Obama has every advantage to win this race with all of the training wheels, spotters, helmet, knee and elbow padding and a running push. The amount of support for a presidential candidate is unprecedented. Never before has so much been done for so long for so little. So, why is the race still more or less a statistical tie? Maybe because he is the weakest candidate the Democrats could have selected and the Clintons are needed to run a pseudo nominees. But every time I see either of them on the stump for Obama, I am reminded of the glaring weaknesses of Barack Obama. I get all nostalgic for the Clinton good old days. And I get angry that it isn’t Hillary running instead of propping up the person who stole her place. It makes me like Obama less. Why can’t Obama win his voters by himself? Isn’t that his job now? If the party was going to rely on and blame Hillary for Obama’s fate, why not put her on the ticket? Right now, she has a thankless job. Not only does she have to work overtime to see him win, but she gets no credit for it or her own work. Her suggestions for the bailout bill were casually brushed aside by Obama and Reid. Is that the way you’re supposed to treat you most faithful party member? Obama has a lot to learn from the Clintons about what it takes to truly inspire voters. He has a lot to learn about how to lose the arrogance and be gracious. He has a lot to learn when it comes to not insulting voters. He has to learn to be enthusiastic and engaging and concise like Sarah Palin, who looked last night like she didn’t need help from anybody.